This list of FAQ is meant to assist you with some common pre-sales questions. If you have any question that is not addressed in this FAQ, please call us. How do the dimensions compare between models? Where can I get technical support for my furnace? How do I perform an above ground (winter) installation? Use the ThermoPEX™ System and a temporary raised base (shown above). Quick and easy, temporary, above ground installation any time of year, giving you time to decide the best possible location for your furnace, without having to worry about frozen ground conditions or snow cover. The ThermoPEX™ System is an all inclusive package with return and supply lines, insulation, and a protective waterproof (and temporarily weatherproof) jacket all in one pipe, and may be buried underground in the spring or summer when it's convenient for you. Central Boiler is one of the leading manufacturers of outdoor wood furnaces in Northern America. Founded in 1984, our company has since expanded to include a line of gas fireplace products. Based in Greenbush, Minnesota where the winter temperatures can drop to 59 degrees below zero, we know the value of safe, efficient heat. What is the Classic outdoor wood furnace? It is a safe and efficient way to heat your home with wood. 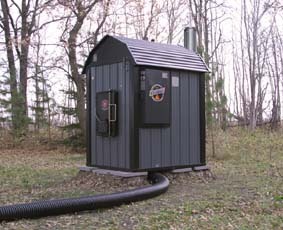 The Classic furnace is designed to look like an attractive storage building and is installed outside, away from the home or building being heated. A water jacket surrounds the furnace firebox and the heat is transferred from the wood fire to the water. How can the Classic heat my home and water? 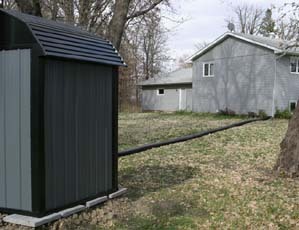 The heated water is pumped to the home or building through insulated underground pipes. Water-to-air or water-to-water heat exchanger or direct circulation conveys the heat into the structure's forced-air furnace, boiler, or radiant floor heating system, and to the water heater to provide domestic hot water. This allows for normal thermostatic control of temperatures for safe, even, comfortable heat. What are the advantages of the Classic outdoor wood furnace? The Classic removes fire hazards from your home or building because all of the burning takes place outside. An outdoor wood furnace won't affect your indoor air quality and can alleviate respiratory and allergy problems caused by indoor wood burning. Current owners of the Classic are using up to 25 to 50 percent less wood compared to other heating alternatives. Since the Classic can burn larger pieces of wood it will dramatically reduce time spent preparing the wood. Thermostatic control provides your home with even, steady heat. Is wood burning bad for the environment? A wood heating system is the right choice for the increasing number of consumers who are concerned about our environment. Wood is a totally renewable resource, which, when burned, results in no net carbon dioxide increase. Carbon dioxide is a part of the natural plant-growth cycle and occurs naturally when trees are allowed to rot on the forest floor. On the other hand, fossil fuels, when burned, release carbon dioxide which otherwise would stay trapped in the earth. This causes a net increase in carbon dioxide, which is believed to be responsible for the heat-trapping "greenhouse effect." So when heating with wood rather than fossil fuels, you actually achieve a net reduction in greenhouse gas emissions. In addition, harvesting firewood has a pruning effect on forests, which allows net growth to flourish. The wood you burn likely comes from your local area -- it's not imported and not subject to price increases due to events outside your control, as is the case with oil. How long will the furnace last? The life of your furnace depends upon proper maintenance. With proper maintenance your furnace will give you many years of dependable service. Central Boiler Classic model furnaces have an optional 25-year warranty available covering parts and labor. (Warranty includes a corrosion coverage.) Pallet Burner models carry a different warranty. What can I expect to pay for an outdoor wood furnace? Prices will vary depending on shipping and options, but our base models start at $4,800. Is this furnace (boiler) pressurized or non-pressurized? The Central Boiler outdoor wood furnaces are non-pressurized. Technically they are atmospheric vented, which means they are safe. Is there a lot of heat loss when the unit is outside and it's below 30° F? The units are highly insulated with air tight waterproof urethane insulation. Can I connect the Classic to a forced air heating system? Yes, more than 65% of all installations are connected to existing forced air heating systems. I only have baseboard electric heat, how can I use the Classic? Many people with electric baseboards elect to install radiant floor heat between the floor joists. Consult your dealer for other hydronic and space heating options. Can I heat my domestic water with the Classic? Yes, with the use of a domestic water heating kit. Most people find they save between $30 and $60 a month. Can I connect the Classic to a pressurized heating system? Yes, in one of two ways. By connecting it directly to the existing system and depressurizing it or by the use of a water-to-water heat exchanger the heat can be transferred from one system to the other. Radiant heat installed under new or existing floors can be a great way to heat your home. Radiant floor heat is the most efficient way to transfer heat, however, it is important that you design the system correctly. Can the Classic heat my pool and/or spa? Yes, many Central Boiler customers heat their pool and/or spa. One of the many advantages of the Central Boiler Classic is the ability to heat multiple buildings from one location. Wood may not be the best fuel choice in densely populated urban areas where automobile exhaust and other pollution already puts excessive strains on the air shed. But in suburban, small town, and rural areas, wood makes good sense. If you choose to install your Classic furnace in a densely populated area the stack height should excess the rooflines of existing homes. Yes. Like most major appliances the unit only requires installation. The Central Boiler outdoor wood furnaces are non-pressurized systems which eliminate this possibility. The Classic is available in nine different colors, one that's sure to compliment the exterior of your home. Currently available are black, white, charcoal, brown, tan, blue, red, camouflage or green, except the Classic CL 7260 and Pallet Burner which are only available in charcoal.